Sleeping Giant Ski Area officially opened in 1938, and is one of America’s oldest ski areas. 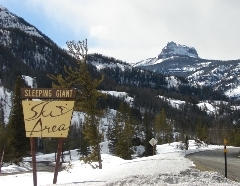 It is Wyoming’s most affordable ski area. Enjoy great family skiing, snowboarding, snowshoeing, Nordic skiing, and snow tubing. Beginner to advanced slopes. Warming hut with cafeteria, lessons and rentals. All fifth graders ski for FREE! Open Mid-December through Mid-March, Friday-Sunday and “No School” days, 9:30 a.m. to 4:00 p.m.